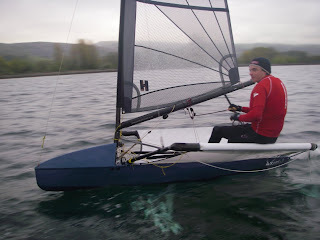 I couldn’t get back in time from the South of France to be able to get my boat packed up and sorted for me to compete in the Bristol Moth open myself, but having found myself a lovely Moth sailing girlfriend, I went up as trolley dolly with plans to cast the fleet off and watch the F1 Grand Prix! 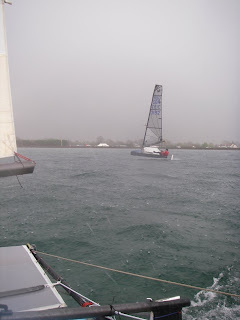 Katherine is on a fast track route to foiling! She’s got an old Axeman that we’ve got sorted into a good little lowrider, with my Mistress 3V ‘The Weapon’ on standby for her to use in the Worlds if she feels ready enough for it. 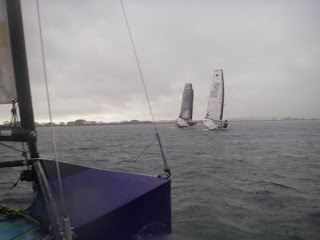 The wind didn’t comply with my wishes early on and the fleet sat around in the sun and near calm conditions. (And there was no tele to watch the Grand Prix on….) 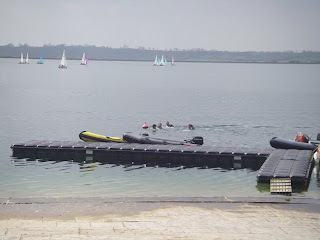 Rod Harris lead the fleet into the water for a swim, only to lose his gps off his wrist, and prompt a bit of free diving to the bottom of the lake to retrieve it! It was a successful mission, but at the expense of Mr Whicher’s rash vest which was taken off in the diving attempts, and found not to float! The breeze started to fill in and the lowriders were first onto the water to go for a sail, but it came in quite quickly and the fleet leapt into action. It felt a little funny watching a Moth race from the shore, but I kept myself busy with Rod’s camera, and my fancy new image stabilised binoculars to keep an eye on proceedings. 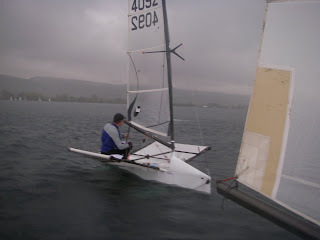 Mike Cooke showed the fleet the way round in impressive style. Katherine decided to sit the next race out, and let me take out the funky purple Axeman for race 2. I think she’d just seen the rain cloud coming though as the heavens opened on us, making for a marked contrast to the sunbathing earlier in the day. I got off the line well, but those evil foilers just flew past me! (Apologies to all those lowriders I’ve buzzed in the last few years!) Tom, Mike and Rod shot off to leeward, but not before I’d dug out my camera and got a quick shot of them! 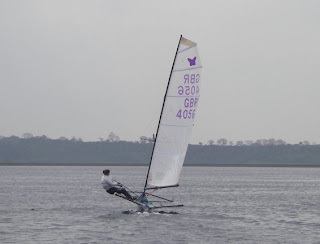 There were still some light patches so I played the right hand side, delighted to see the foilers struggling to remain in the air out on the left! 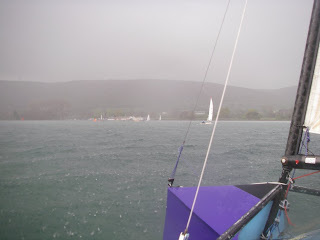 Oh we might have a race on… With torrential rain by now it was hard to see where the pressure was, and it was funny watching foilers zig zagging around in search of something. I think I rounded the top in 4th or 5th, just ahead of Rod, so I had to get a photo of him! With a light run next I managed to pull away from him and started to chase down Mr Whicher. We had a great little tussle with many lead changes, and if it wasn’t for a slight navigational error on my behalf at the club finish line I’d have got him, but it was a beep, beep finish, for 4th and 5th with Tom deciding to wrap himself around the committee boat anchor line for a while! I think I’ll retire from lowriding now though, and recommend anybody considering the change to foils to do it early. As long as you can handle the low speed handling of a lowrider, you’ll be able to sail a foiler. I think lowriders are harder in many conditions. Special mention of the day must got to Alan Watson. Alan ripped his tramp on the Saturday, and stayed up until 3am stitching it up again (then rumoured to go out clubbing until 5am…) It unfortunately ripped again during the first race on Sunday. Not to be deterred though he returned ashore, and covered the ripped area with a towel! Lashed the corners to the wingbars, and went back out to claim 3rd overall in the open!